Fencing Products | Pennsauken, NJ - Discount Fence Co. Inc.
Add privacy to your fence! Discount Fence Co. has been selling and installing chain link fencing products in Pennsauken, NJ, since 1964. We have expanded our fencing with vinyl & ornamental aluminum & steel. We have experts in our sales and installation departments who can guide you on your fence purchase. Discount Fence Co. has facilities to custom make any size or type of gate. Please enter our chain link fence showroom and learn more about our company and products. Also, check out our Vinyl and Ornamental fencing. We have many new departments including privacy screening, rolling gate kits, residential and industrial hardware and parts, privacy slats and dog kennels. Contact us today to get started with our fence installation services. Thank you for visiting our site. 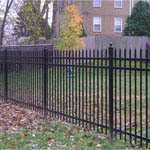 Discount Fence is one of the largest fence suppliers in New Jersey for Do-It-Yourself. If you’re looking to get your fence supplies & parts at a good price with expert advice, give us a call or stop by and visit us in Pennsauken, NJ 08110.